As a Russian who was born in Ukraine and cooked many cabbage rolls recipes back there, I can attest that Russian and Ukrainian recipes are practically the same. The process is long, messy and laborous. The result is far from healthy due to tremendous amounts of fat. I optimized it over the years to make it as quick and easy as possible. 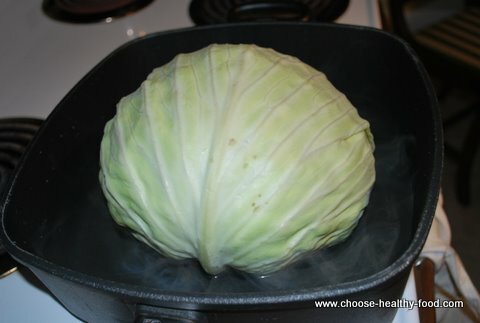 I also reduced amount of fat to produce healthy cabbage rolls. So, use my recipe with step by step pictures with confidence. 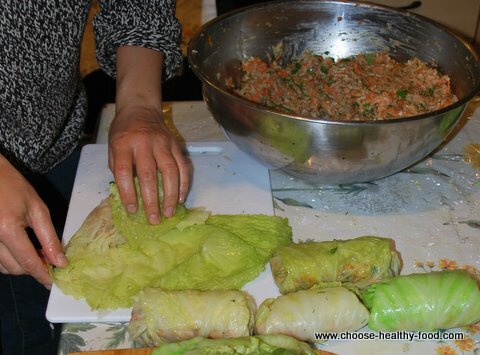 If you are concerned about your food being good for you, there are a couple of things you need to know about cabbage rolls..... Don't fall into the trap of thinking that because they are made with cabbage, they are auomatically good for you. There are a lot of cabbage rolls recipes from the Ukraine or Russia that are very tender and delicious because of enourmous amounts of fat added to the stuffing and sauce. 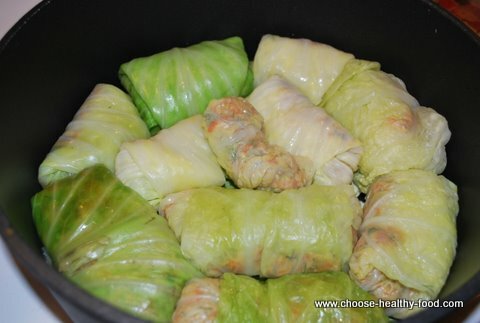 For example, one of the secrets for best cabbage rolls is to fry each cabbage roll individually before putting them into the casserole dish and baking them. You don't want that if you want heart healthy recipes that are good for weight loss. 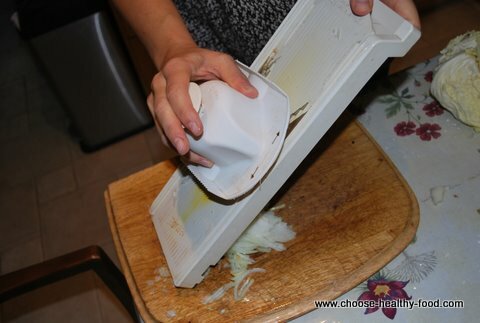 Read my article How to make cabbage rolls healthy for more detailed explanation. My cabbage rolls recipe is great for the Weight Watchers, and for anyone on a weight loss diet. So this recipe is not quick and easy - but it is the quickest and esiest recipe for cabbage rolls. The only quicker version that I know - and will share later - is recipe for lazy cabbage rolls, but it lacks in presentation. Warning for vegetarians and vegans: 99.9 out of 100 recipes on this site are suitable for you, but this one is a classical Ukrainian cabbage rolls recipe that contains meat. You will need to "veganize" the filling. Or you can check out Ukrainian Vegetarian Cabbage Rolls Filling variations from my grandma's cook book - they are authentic, delicious, and well tested. 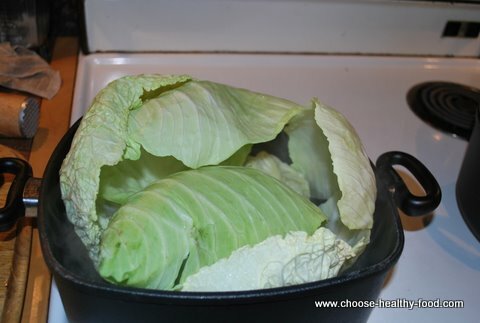 Note that deep casserole dish or roasting pan would be OK to use for one batch of cabbage rolls, but I usually make two batches and use cast iron Dutch oven to fit two or three layers of cabbage rolls. Put one casserole dish, one big pot (3 lt) and one pan on the stove top. Fill out casserole dish or Dutch oven with 4 cups of water, and the big pot with 4 cups of water as well. Let the water boil. Clean and grate carrot and onion. Heat the pan, add 1 tsp of oil, reduce heat, and fry carrots and onions stirring occasionally until soft. Add tomato paste or pasta sauce and fry of 5 more minutes. 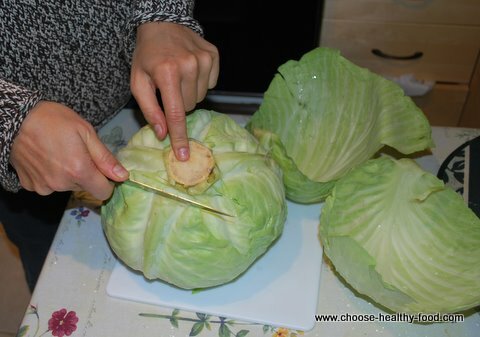 Turn the cabbage stem up and make cuts at the base of the leaves. Try to separate them from the cabbage. 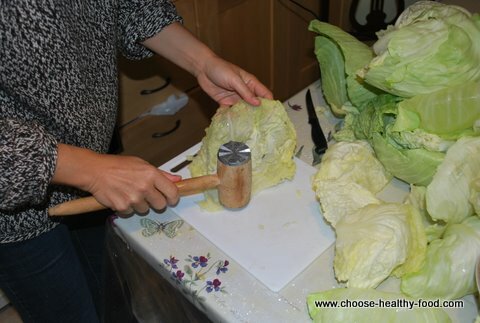 If that doesn't work, next time select loose cabbage head, and meanwhile place the whole cabbage into the pot with boling water stem down, and cover with a lid. Check your rice. If it is half done, strain the water out and put your rice in the big bowl. Do not overcook the rice! 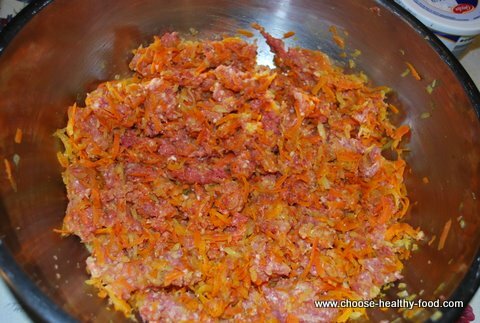 Add meat, spices, and carrot-onion mix to the rice and stir well. On rare occasions when I cook cabbage rolls, I use ethically raised meat without antibiotics and hormones. Check your cabbage - are outer leaves soft? Cut them out and leave cabbage in for a bit longer. When you separate enough leaves, put them back in the boiling water for 1-2 minutes if they have uncooked spots. If your cabbage was loose and leaves separated well, this would be your first step. Wrap the stuffing into the cabbage leaves. Place it closer to the thick side of the leaf, fold the leaf as an envelope. and roll. Sprinkle oil on the bottom of the casserole dish. Place a couple of unusable cabbage leaves on tbe bottom. There are always a couple of leaves that were torn in pieces, they are ideal for this. 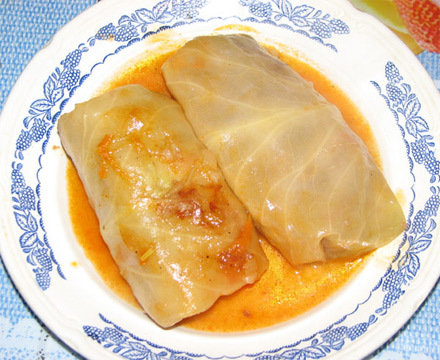 Place cabbage rolls close to each other in layers. Add sauce. When all of them are in the dish, add hot water and heat the dish at the stove top. Let them bake for minimum an hour, better two or even two and a half. This is another tip from the Ukrainian women who make cabbage rolls often: longer cooking time makes cabbage rolls taste better. Serve with sour cream and dill - or whatever you feel like. Try to make your own and enjoy one of the oldest and most loved dishes of Eastern European kitchen.